We invited the CARF surveyors to evaluate how well our services meet international standards for quality. The survey team will be looking at many things about us and our services. The survey will tell us what we are doing well and ways we might improve. As a result of this survey, our services may earn or continue CARF accreditation. As part of the survey, the surveyors will interview people who use our services, their families, our staff, and others. • Are our services provided in a clean and safe setting? Facilities, the accrediting body is now known as CARF. We are mental health professionals and we should be clear about this particular strategy. We believe in therapy and it’s power to help clients heal. 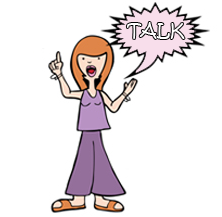 We believe that talking creates an energy that helps us sort out our confusion and build a stronger future. So why do we neglect that very strategy when confronted with our own stress? We certainly suggest it often enough to our clients. And we talk all the time about the importance of speaking openly about what is important to us. In this strategy I will suggest something even more important. It’s not just talking, it’s about when we talk and with whom. When you are working with clients facing tremendous stress, trauma and difficulties, you need to be sure you use the strategy of “debriefing.” When you have met with a client or had a difficult session or been on a particularly troubling home visit – find a colleague or supervisor and talk about it – right then. Don’t wait for the traditional and formal supervisory opportunity. Do it NOW! There is something different about thinking through your initial observations out loud. Immediate reflection provides very different insights than the more considered reflection of a formal supervisory session. Both are important to good clinical intervention. But we tend to ignore the immediate option. When I was a young social worker, practicing in a private child welfare agency, I was in charge of the foster care placement of children when there was an allegation of child abuse or neglect. I was the one who received the children at the time they were removed from a parent’s custody and placed in foster care. I remember particularly an occasion when we received word that there was a family of four children to be placed within the next two hours. My first reaction was, perhaps understandably, considerable panic. Which homes, split the children, who could take them all? All of these questions were spinning in my mind. Two of my colleagues came into my office and we had a 20 minute conversation about our options. We briefly talked about foster families we knew, strategies that would be good or ways to handle the split of the siblings. While management wasn’t sure that was a necessary use of three staff members’ time, I know without a doubt that we made better placements because we took those 20 minutes. And the things we discussed in that meeting were very different than the very important conversations that would later ensue in proper supervision. Talk with your colleague, supervisors and others who have an understanding of what you do. It helps also to make it possible to go home to your family and leave the stress of the day at work – at least more so.